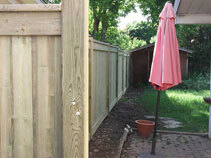 Vinyl Fence Toronto Fence Canada has a variety of full privacy premium pressure treated wood fence systems, designed to offer an organic, natural wood appearance, while delivering complete privacy for your property. 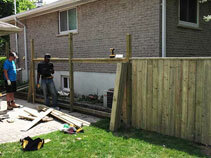 Pressure treated wood is designed to resist rotting and degradation, making this fencing solution an affordable yet durable solution for your home or business. 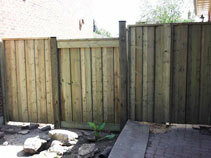 This style of fencing is very versatile too, as it looks wonderful alongside a wide range of different architectural and landscaping styles. 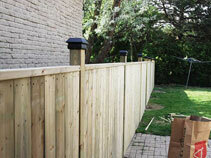 Vinyl Fence Toronto Fence Canada sells and installs privacy premium pressure treated wood fencing across the Greater Toronto Area (GTA.) 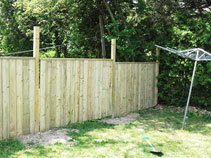 Wood privacy fencing installation price estimates are available by visiting our price quote page. Simply enter your information and one of our experts will be in touch to discuss your fence installation project!